The Bemuhene of Ajumako Traditional Area in the Ajumako-Enyan-Essiam District of the Central Region, Nana Akyeremfo XII, has been adjudged the overall best farmer, 2017, followed by Mr. Kweku Saah as the second runner-up. 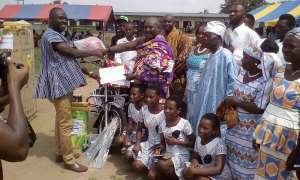 A physically challenged farmer, Mr. John Donkoh and others including best staff of the District Agric office were also rewarded at the recent Farmers Day Celebration. The Ajumako District Chief Executive, Rev. Kwesi Nyarko, addressing the gathering, indicated, MMDA’s are expected to also understate the agricultural project with a budget that would support Ghc 10,000.00 to 20,000.00 farmers to cultivate an average of ten acres of the crops within the next four years. ‘’Government as part of effort to boost the economy has introduced planting for jobs and investments, targeting about three to five million farmers in the cultivation of seven identified cash crops within the next four to ten years’’. ‘’The crops included cashew, Shea nut, mango, rubber, oil palm, citrus and cocoa of which Ajumako has chosen oil palm, cocoa, coconut, and cassava’’. According to him, as part of government plans to create ready market for the massive harvest of farm produce expected this year, National Buffer Stock Company has been revitalized to procure, store and distribute the outputs from the Planting for Food and Jobs. He collaborated the statement of the Fisheries and Aquaculture Development minister, that the country’s fish stock continued to deplete as a result of bad fishing practices, thus, appealed to fisher folks to desist from such practices to replenish the fish stock, whilst asking Ghanaians to say no to bad fish. Rev.Kwesi Nyarko commended the contributions of farmers and reminded Ghanaians to thank farmers and fishers for every meal that is consumed. He used the celebration which coincided with the celebration of the World Aids Day on the theme, “the Right to Health: Know your HIV status, seek early treatment”, to encourage Ghanaians to seek early treatment, which was the only to the country could eliminate AIDS by the year 2030 as stipulated by UNAIDS. The Ajumako District Director of Health Services, Madam Doris Ahelegbe, observed, the current national HIV prevalence among women attending antenatal clinics is 2.4%, which represents a rise from the 2015 prevalence of 1.8% and the 2014 prevalence of 1.6%. She indicated, HIV prevalence in urban areas was higher with 2.5% than rural areas with 1.9%, with age distribution of 5.6% for 45-49 years, 35-39 years with 3.5%, and 15-19 years being the lowest at 0.6%, with HIV prevalence among STI clients at 5.4%. According to her, HIV prevalence in the central region for 2016 was 1.8% with Ajumako Enyan Essiam District recording 45 and 63 new cases for 2015 and 2016 respectively, through the various means of testing , such as during ANC, voluntary testing and for TB patients, adding, the district has already recorded 34 new cases as at half of the year 2017. She said the directorate as part of efforts to address the situation, has intensified Public Health Education to impress upon people to reduce the frequent change of sexual partners, learn to recognize STIs symptoms, and seek early appropriate treatment. Additionally, they have made efforts to prevent mother to Child Transmission (PMTCT) of HIV by testing all pregnant women and testing of all TB cases. Madam Ahelegbe called on stakeholders to help secure an Anti-Retroviral Therapy Centre in the district since its absence, makes monitoring of such patients difficult, as they are always referred to our Lady of Grace Hospital, in Esikuma Odoben Brakwa. The District Director of Agriculture, Mr.Alfred Yaw Gokah, noted, two hundred and seventy-six (276) farmers made up of one-hundred and ninety (190) males and eighty-six(86) females benefited from the supply of improved cassava planting materials. He added that 707 bags of NPK fertilizers, 358 bags of Urea and 432 kilos of seed maize, costing 59,193.50 were supplied to the beneficiary farmers, which about fifty-three percent of the costs of inputs supplied have been recovered. He commended the government of Ghana for subsidizing the inputs despite the numerous challenges and activities undertaken to help increase food production for the citizenry.